Recently, I have spent quite a bit of time working with PowerShell’s Out-String cmdlet. 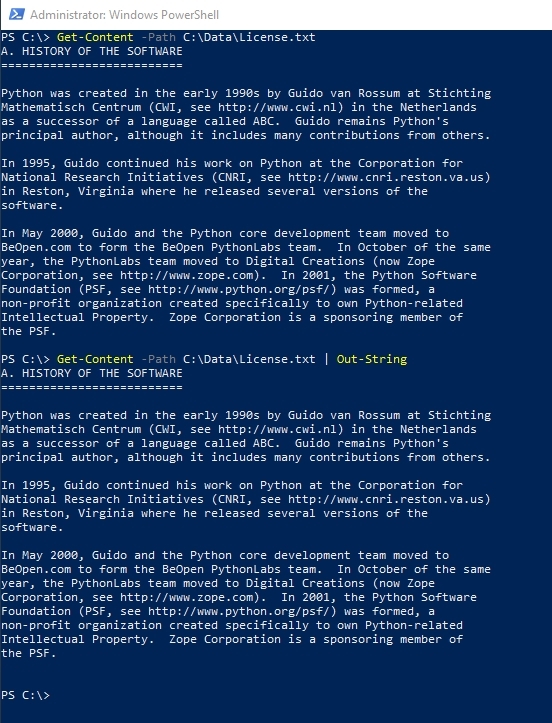 The basic idea behind using this cmdlet is that sometimes text output within PowerShell can become a bit unwieldy. The Out-String cmdlet gives you an easy way of taking text and assembling it into a string that you can then display or manipulate on an as needed basis. Let me show you a few of the things that you can do with this powerful cmdlet. The thing about this command is that it only displays the contents of a text file. It isn’t well suited to allowing you to manipulate the text file’s contents (although you can do it in a roundabout way). As an alternative, you can use the Out-String cmdlet to not only display the contents of a text file but also to format the output to suit your needs. So let’s take a look at a couple of examples. 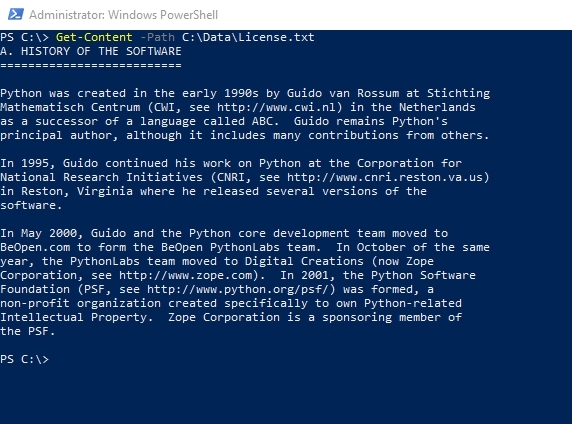 If you look at the screenshot below, you can see that I have used the Get-Content cmdlet to display the contents of a text file named License.txt. This file is simply the Python license file, but I shortened it for the sake of getting the file’s entire contents to fit on the screen. Now, if you look at the next screen capture, you can see that I have appended the Out-String cmdlet to the command that I already used. At first, it would seem that I’m not doing anything different because the output is exactly the same. The important thing, however, is that the text is now being treated as a string, and strings can be manipulated. You can see these commands in action in the screenshot below. I have also displayed the full contents of the $A variable so that you can see that I am indeed displaying a subsection of the text file. One thing to keep in mind is that because I am working with string output, I can manipulate that output in a variety of ways. For instance, I might replace some characters with alternate text, or I might truncate part of the output. 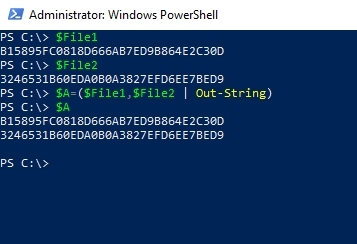 PowerShell provides a number of options for string manipulation. You can see the output in the screenshot below. As you look at the output, you will notice that even though the $A variable contains both hashes, they are listed on separate lines. The documentation for the Out-String cmdlet indicates that you can remove the line break by appending the NoNewLine parameter. In practice, however, this parameter is not supported (at least not in the Windows 10 version of PowerShell that I am using). There is one more trick that I want to show you. If you work with PowerShell, you are probably familiar with commands like Get-Process, Get-Service, or Get-VM that display long lists of items in their output. You can use the Out-String cmdlet in conjunction with such commands. In doing so, you can write all or part of the output to a string variable. The advantage to doing this is that you can filter the output in pretty much any way that you want. If you look at the screenshot below, you can see that I have created a variable named $A and mapped it to the Get-VM cmdlet. When I output the variable’s contents, I am presented with a list of the VMs on my computer. My $A variable contains a list of my VMs. As you can see in the screenshot below, the output is not only concatenated, it has also been filtered to show only VM1. 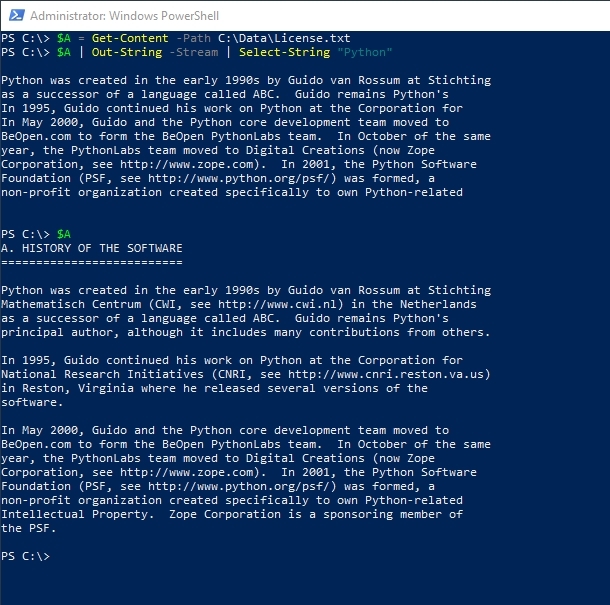 As you can see, the Out-String command allows you to do a variety of creative things within your PowerShell scripts. 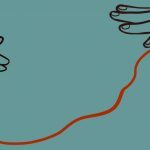 In fact, this article really only just begins to scratch the surface of what you can do with strings in PowerShell. Excuse me, but that is now how you PowerShell. You don't need to delimit PowerShell output by tabs, char count, commas or anything. $a contains an array of objects, each having a Name and State property among others. Format-Table can read objects and it can selectively display some of their properties in a neatly formatted table for the human to look at. to filter out the one you want right at the source. This is faster. PowerShell does not work like an old UNIX shell. It is a couple decades newer.